You know how when you get a nice new carpet, its so clean and fresh and soft on your feet? After a while, after many steps are taken on the carpet, through the daily messes and spills of life, the carpet gradually gets dirty. It happens so slow that you barely notice it. Then one day, you rearrange your furniture, and see that square of still sparkling and soft carpet that has been protected by the couch covering it. At this point you want to clean the carpet, to get it back to the splendor it once was, or you want to overhaul and get a whole new carpet. You remember when the carpet was fresh and new, almost perfect, and you realize you want that back. Before seeing that square patch you had gotten use to the stains and dinge the carpet held. That is life. 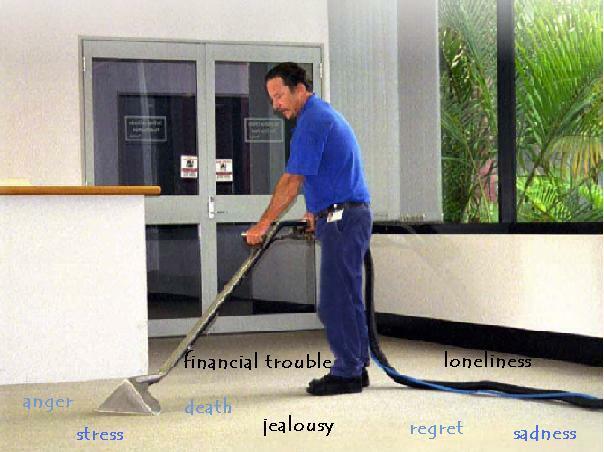 There are daily trials and tribulations in life that make our carpet dirty. The key is, don't get use to the dirt. Don't settle and become complacent with the dirt and grime of life. Always remember that clean patch of carpet. The you before you lost your job, the you before your husband/wife left you, the you before you lost that loved one. Remember that shiny clean patch, because if you get use to the dirt, it can over take you, and make you forget that you once had a glimmering, soft carpet to walk on, and once you forget, its hard to get that back. Don't let the stains stay on your carpet forever. You can be clean again. Happy it could touch you! Hey there! ((((waving)))You have your way with words and ojects. lol This is a very encouraging write. This is a good way of looking at it! It's very timely as well, given current situations.